Recent estimations (AMS OBOR study, January 2017) revealed that 20% of North - Western European maritime trade flows are under risk of substitution by a Northbound land route starting from a new European hub in Piraeus and nearby Mediterranean ports, following substantial infrastructure investments by Chinese shippers and trade investors (Cosco, China Merchants Bank, Sinotrans, AIIB, ) With upgrading smaller ports and road infrastructure in the Balkans, cost-effectiveness ratios shift, and pressure is on 2 Seas ports to become more efficient and innovative. Major ports are initiating custom-built shared data platforms (e.g. Antwerp, Rotterdam, Calais), operating on different standards and governance approaches. The ports seek to stimulate development of smart port applications based on new data science and IoT possibilities through incubation and acceleration programs. However, if data science capacity could be aligned with ports’ demands and complex multi-stakeholder challenges, it would address an important strategic need of the ports and speed up market development for the still immature data science industry. c. by building the preconditions for a world-leading smart ports ecosystem in the form of a development funnel. entrepreneurial success diagnosis and for value delivery, allowing entrepreneurs to understand the road to further professionalization and growth and ensure value capturing at both sides of the market: entrepreneurs and end users. Empower the 2 Seas smart ports cluster to become a world leading innovation hub for the development of smart port apps. Boost the operational excellence and technological sophistication of 2 Seas port users through the increased and world-leading functionality of their data science and IoT platforms. Stimulate product development and adoption, the uptake of cutting-edge scientific knowledge and the inflow of entrepreneurial financing into the smart ports innovation cluster to boost economic development in the partaking regions. SPEED (Smart Ports Entrepreneurial Ecosystem Development) is a project that aims to develop the conditions for a leading smart ports innovation ecosystem that bridges the port logistics networks and (mostly SME) data science networks in the European 2 Seas region. With this project, we aim at developing an open innovation ecosystem containing a smart port app development funnel and an ecosystem network administrative organization to set an agenda and galvanize investments in aligned smart port innovation. The project will develop a toolkit for entrepreneurial success diagnosis and for value delivery, allowing entrepreneurs to understand the road to further professionalization and growth and ensure value capturing at both sides of the market: entrepreneurs and end users. 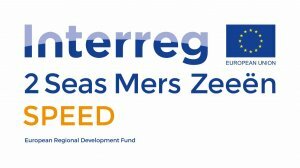 * Interreg 2 Seas 2014-2020 is a European territorial cooperation program for England, France, the Netherlands and Belgium (Flanders).